The Shire of Boddington continues to ensure its long term sustainability with the development of strong relationships with local industry. Home to two of the Peel region’s largest employers, South32 Worsley Alumina and Newmont Boddington Gold, the Shire of Boddington boasts low unemployment for its residents, in a rural settlement within 90 minutes’ drive from downtown Perth city. The Shire of Boddington is proud to have a point of difference when it comes to being a mining town. In comparison to other mining towns which were only established to service the mining industry, the Shire of Boddington was originally built on agriculture, timber and the rail industries and had its feet firmly on the ground when gold was discovered in 1986. Managing to withstand the closure and subsequent reopening of the Boddington Gold Mine the Shire knows how important it is to ensure it can respond quickly should that event occur again and as a result has been working hard on infrastructure and economic development projects to ensure its long term viability within the Peel. Completed in 2017 the new $3.5m Boddington Recreation Centre is the biggest of the new facilities being introduced to the local community. Two multi use courts, a large function space with enviable commercial kitchen, bar area and various changing rooms & offices, the facility can comfortably accommodate the needs of the local community. The new Hotham Rise Independent Living Units are also being favourably received by residents who now have available to them options which will allow them to retire comfortably in their own town whilst still being able to access the benefits of specialist health services in Perth, Mandurah or Narrogin as they age. Seven purpose built two bedroom units, a community hub and community garden make up the new complex which is smartly located adjacent to the Boddington Medical Centre and Hospital. The complex has room to expand and can eventually house up to 40 residents. 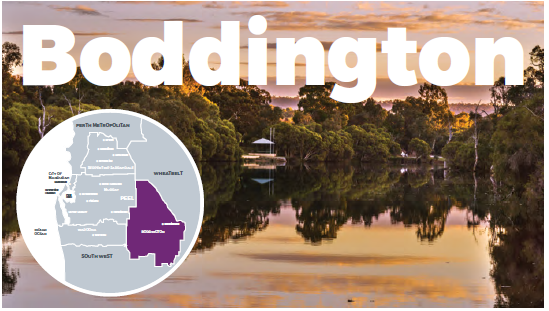 Tourism has become a strong focus for the Shire of Boddington in recent years, and while mining is its key economic driver, Boddington is the perfect distance from Perth to offer a quick country get away for those in the city. Nestled alongside the tranquil Hotham River the township of Boddington prides itself and is well recognised by visitors for offering a warm welcome as they visit the town. Ideally positioning itself as the eastern gateway to the Peel, the Shire of Boddington is working on developing more self drive trails to ensure it can capitalise on the growth in the trails industry being experienced in the Peel region. The Hotham Williams Economic Development Alliance, through their brand of Marradong Country, will release 5 Self Drive Trails that connect Boddington to Wandering and Williams. The three local governments jointly offer a diverse rural tourism package that includes heritage and environmental favourites such as the well known Quindanning Inn, Boddingtons’ Tullis Bridge Rail Trail, Dryandra Nature Reserve and Williams Woolshed. Go West also launched their Mine to Mint Tours to draw international tourism into Boddington with their one of a kind gold tour. Premier Mark McGowan remarked on how positive it was to see the mining and tourism industries working together to create a high quality tourism product. The Shire of Boddington will gain international exposure as a result of the tours and hopes to see other tour operators gain confidence in the region as a place to develop more tourism product. This article was first published in the Peel Magazine, Spring/Summer 2018 – vol 4.2 – to read and download the full magazine, click here.